January 14, 2008  A new study last fall revealed that serious drug-resistant staph infections are far more common than previously assumed. The study produced a wave of reported cases from across the country. How common are these infections, who gets them, and how can they be prevented? January 9, 2008  The sudden death of several prominent young athletes has drawn attention to the problem of silent heart disease. Studies are underway to determine who is at risk. November 14, 2007  In a series of stories during November, NPR's All Things Considered examines the new globalization of health care. Here, a series overview. November 9, 2007  Merck pulled Vioxx off the market in September 2004 after it was revealed that the drug increased the risk of heart attacks and strokes. Here, a look at what has happened since Vioxx was taken off the market. July 6, 2007  A Catholic priest and the Indian Red Cross have created what some say is a model for AIDS care in the developing world: a combination hospital and community center. July 5, 2007  At the turn of the 20th century, the clear air and hygienic surroundings of Bel-Air were promoted as therapeutic and restorative for patients with tuberculosis. Today, the bucolic setting of Bel-Air is still seen as healing — now for patients with HIV, many of whom also have TB. May 7, 2007  The Senate is expected to vote Monday on a plan to let consumers legally buy prescription drugs from other countries. 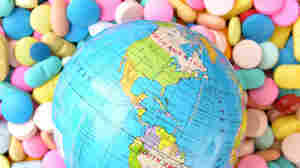 Support for importing drugs has grown despite safety concerns posed by the Food and Drug Administration and the drug industry.